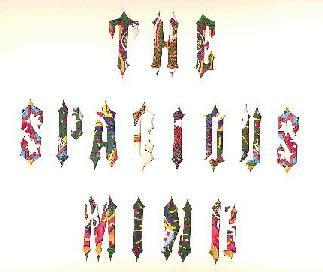 The Spacious Mind - "Garden Of A Well Fed Head"
Sweden's master's of mind expansion have released this vinyl only gem (limited pressing of 600) that is as mind blowing as anything they've released. The packaging is gorgeous and makes me pine for the old days when buying a record gave you both music and a good sized piece of genuine artwork. "The Spacious Mind" is diecut into a white cover which opens up to a beautifully tripped out psychedelic colored painting. And speaking of beautifully tripped out psychedelia... The music! The Spacious Mind play real lava lamp style spacerock. At one moment you'll be grooving along to acoustic flower power folky instrumentation, and before you know it soaring acid guitars and bubbling synths will sweep you away into a heavenly vortex. Side A begins with "In The Land Of Roses And Snow". An accordion sounding organ repeats two vibrating notes along with simple percussion while an efx'd voice tells a story I can't quite understand. Synths soon start to bubble and gyrate as if dancing around the story teller. "The Cave Song" consists of acoustic guitars, Middle Eastern percussion, and didgeridoo among other things that trip along for a while and create a peaceful atmosphere. The rest of Side A is "Upon Which Areas May The Circles Be Drawn", which for my money is a psychedelic tour de force. The bass provides the backbone in the form of a simple bluesy melody while the twin guitars assume battle positions for the assault to come. Everything builds up very slowly but when it takes off you'll experience a fireworks effect in your head and find yourself among the stars. Beautiful cosmic guitar work. Most of Side B consists of "Euphoria Euphoria", yet another gorgeous musical journey. The guitars and keyboards weave in and out of each other so smoothly that only close listening uncovers the individuality of each musician's contribution because it all blends together so well. There's also some beautiful wah wah guitar soloing that leads the extended jam bringing us to the song's conclusion. The album closes with "Sweetness To The Lord" which sounds like a psychedelic big band warm up, but serves as a fitting close to what indeed left me with a well fed head. A real treasure from The Spacious Mind. Now if only they'll get their new Mind Of A Brother disc released. Finally, the Holy River Family Band has been getting a lot of justifiable attention these past couple years so if you've fallen for that band but haven't yet sampled The Spacious Mind you should know that they are related both musically and by common members. Available through Lone Starfighter Records at their web site. You can also visit The Spacious Mind at their web site.